There has been a paradoxical shift in my classroom and my own habits. The students have stopped asking for printed handouts but at the same time they started to take their own notes with pen and paper. Similarly, I use more pen and paper while at the same time praising the paperless office. Why is this? 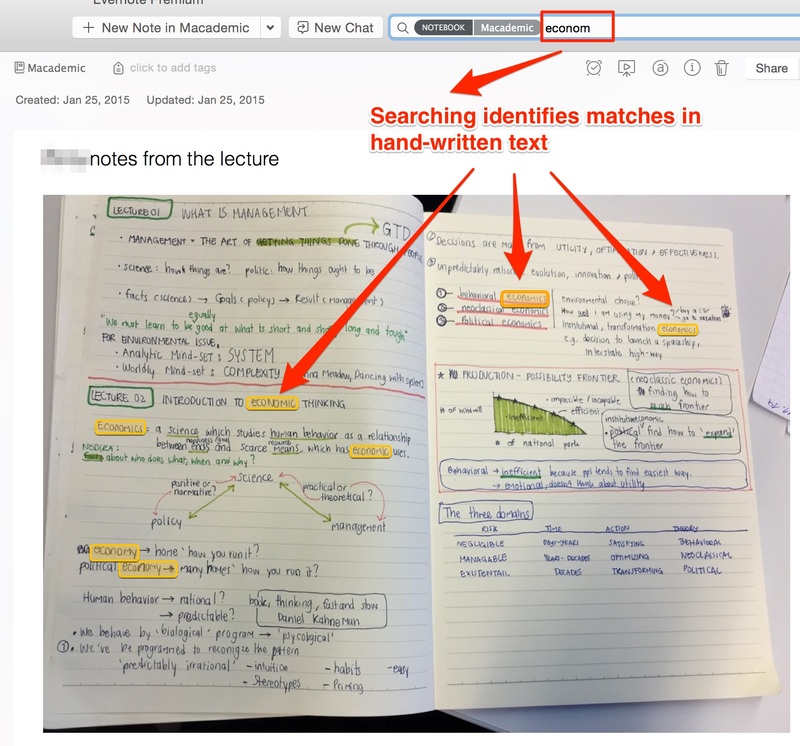 Handwritten lecture notes imported to Evernote and searched for a specific term. During the last decade teaching, learning and research have decisively shifted away from paper. Digital information is much easier to store, search, duplicate, re-arrange and distribute. Yet pen and paper remain unmatched when it comes to swiftly capturing ill-defined information or initial thinking through fuzzy ideas. I find that these simple tools work much more naturally in meetings, especially when your active engagement is required. Most of my students apparently think the same about lectures. I recommend Mike Rohde’s Sketchnotes to those who are serious about note-taking. 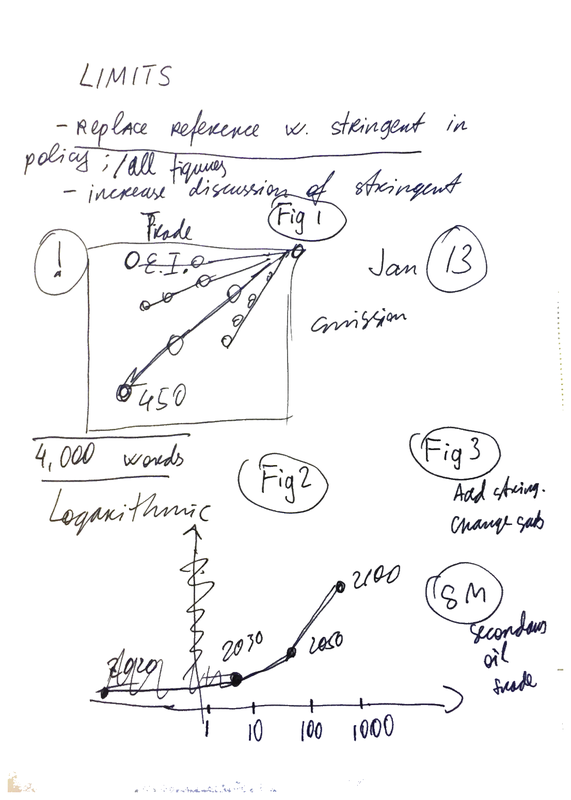 Moreover, my writings or presentations, especially on new and difficult topics, nowadays almost always start with messy notes and arrows on paper. OmniOutliner, Scrivener or Keynote can be used at a later stage to add structure and detail. The recent advances in technology blur the boundary between paper-based and paperless, handwritten and digital. Handwritten notes can be easily scanned into a desktop scanner such as Fujitsu ScanSnap or photographed with a mobile device or a tablet. If stored in Evernote, they can be searchable (surprisingly, even with my handwriting). Evernote also supplies fancy Moleskine Notebooks where your handwriting can be more easily captured with their mobile app. I bought one of these notebooks but have not used it yet. Instead, I have been using a much cheaper Whitelines notebook produced by a young Swedish company. Their notebooks have almost invisible white lines and markings on light grey paper. Their Whitelines Link app captures your handwriting with an iPhone camera without even the need to press the button. Then all markings are removed, the page is straightened (with the help of those white lines) and can be sent to Evernote, Dropbox, an email address, or stored in the app itself. great post, ever since hearing you on macpowerusers I’m a huge fan. As a new grad student for the second time, almost 30 yrs later, and an avid evernote user for my personal life, I’ve been trying to decide how to save, file, store academic info for effective and frequent retrieval………should I also store in evernote? I’ve heard the learning curve is tremendous for Devon Think, very interested in recommendations. Thanks for your post Aleh, I’m anxious to check out sketchbook and whitelines. I’ve certainly kept the pen and paper going as I think my brain just retains and stays the most focused with those tools in hand. Thanks, Dana. I recommend to start with Evernote – it’s very good for capturing from various media. At first the number of your notes won’t be very large so you can experiment with various forms of organization and even, if necessary, transfer them to a more sophisticated system like DevonThink. Good luck and please share how it goes. Evernote has a new app Scannable (https://evernote.com/products/scannable/). It will automatically find, zoom, crop and send to evernote any document which you line it up with. This avoids the tricky task of holding the phone still while trying to click the capture button. I find Scannable very useful in scanning ANY document (not just my hand-written notes). In many cases it’s actually faster for me to use it for a couple of page document than to run to a scanner on another floor.